Gratitude’s all fine and dandy on Thanksgiving, but does it have a place in our everyday lives? Gratitude heightens our joy; it helps us appreciate all the blessings we’ve been given and broadens our perspective to see beyond the challenges we’re facing. 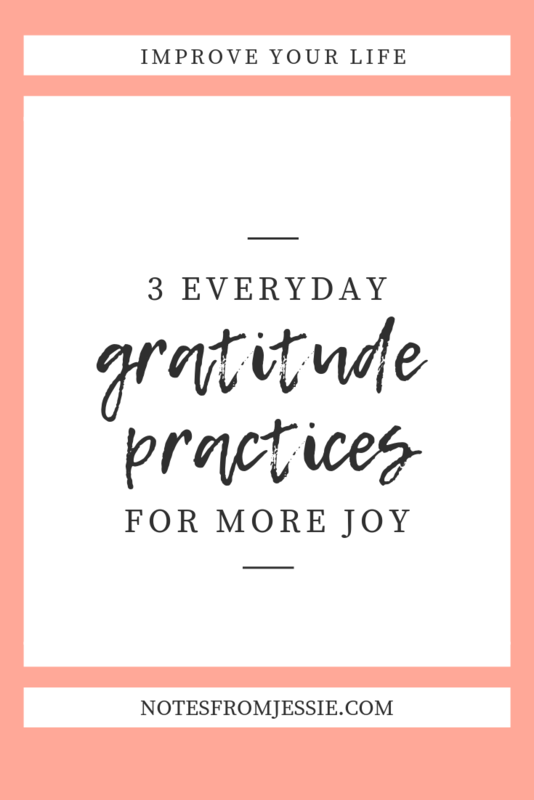 Here are three things we can all do to grow our own gratitude practices and experience more joy in our lives as a result. Thankfulness is a learned habit. We don’t have to cultivate it ourselves, and we’re not limited to whatever amount we feel we currently possess. When we don’t feel particularly thankful, we can pray for a more grateful attitude. When struggles, challenges, and difficult situations have us focused on our frustrations and stress, we can pray for a bigger perspective so we can see the things we have to be grateful for. We can also talk to others and allow them to help point out the things in our lives that we have to be thankful for when we’re not able to see them ourselves. We all do better together, and there’s no shame in getting help to see the bigger picture and focus on the positive things. For instance, after I had gone through a particularly painful breakup and was talking to a dear friend about how I felt foolish for taking a risk in putting my heart out there and thinking it was in some ways a waste of my time, my friend was quick to correct me and provide some much-needed perspective. It was through that relationship that my heart was opened to the idea of spending the rest of my life with someone, which it hadn’t previously been. And while that guy wasn’t the right one, saying “yes” to the idea of a relationship with him paved the way to saying “yes” to a relationship with the man who is now my fiance. While the experience wasn’t the most fun, I am grateful for what it opened me up to and paved the way for. I had to learn to be grateful for that, though. It wasn’t my natural inclination. It certainly wasn’t my knee-jerk reaction in the moment. Who would react that way? Thinking, “I’m glad I went through that painful breakup. I’m grateful for that experience.” Nobody is my guess. But with some added time and distance from our less-than-fun experiences, we just might be able to see how they’ve prepared us for better things or given us opportunities and blessings we might not otherwise have had. And sometimes we need a little help from our people to get there, too. One of the biggest things that has contributed to my own gratitude practice is taking the time to actually write down what I’m thankful for. It’s one thing to try to just be grateful more often; it’s another thing entirely to have a regular practice of noting what you’re thankful for and committing it to paper so you can keep track. People do this in all kinds of ways. I’ve seen ongoing lists that people create and add to as they think of things (which is what I’ve done this year). I’ve talked to people who write down three things they’re thankful for every day (which is what I’m planning to do this year). I’ve heard of people going around the table at dinner on a regular day (not just Thanksgiving) to share what they’re all thankful for. No matter what format it takes, it can be immensely helpful to have a written record of the things you’re thankful for. Why? A few reasons come to mind. It helps you stay consistent in your gratitude practice. It provides a record to look back on later. It forces you to think outside the box and list more than just friends, family, and health. It helps you focus more on the positive. It becomes more of a part of your routine because it’s something you do, not just think about. As I’ve said, this year I’m aiming to start my own gratitude practice of writing down three things I’m thankful for each day. It’s not that three is the magical number; it’s about the daily practice of thinking of the good things in life, all the things I’ve been so abundantly blessed with. And I encourage you to adopt your own practice! I promise your life will be richer. You will be more joyful. Your relationships will be fuller. Your entire life will be more vibrant. Not because you’ve done anything to change your circumstances, but because by adopting a regular gratitude practice, your perspective will shift just enough to allow you to see more of the good things already present in your life and focus more on them. I invite you to begin this practice with my 7-Day Gratitude Journal that you can grab for free! It will help you think outside the box when coming up with things you’re grateful for and give you plenty of space to start writing down your own gratitude list on a daily basis.